Bullseye Glass Company,the innovative company that developed a wide palette of sheet glass suitable for fusing in a kiln, is now giving the public a chance to participate (to an extent) in its creation. On Thursday, July 27 at noon, Bullseye’s Portland, Oregon location will be holding a class for 20 students to assist in the casting of two separate sheets of colored glass, some of which will be doled out to students. This is the first time that Bullseye had opened the floor for students to take a class in creating the product that Bullseye innovated almost 40 years ago in the form of a public class. Bullseye has held sheet-casting sessions as a part of longer workshops, but were cautious about bringing it to the public at first as its own class. After testing it out as a component to other classes, the production crew feels that sheet casting has received enough praise and customer demand that it is ready to be offered a la carte. Now, Bullseye anticipates a wide range of participants, from artists to hobbyists to glass enthusiasts and collectors. 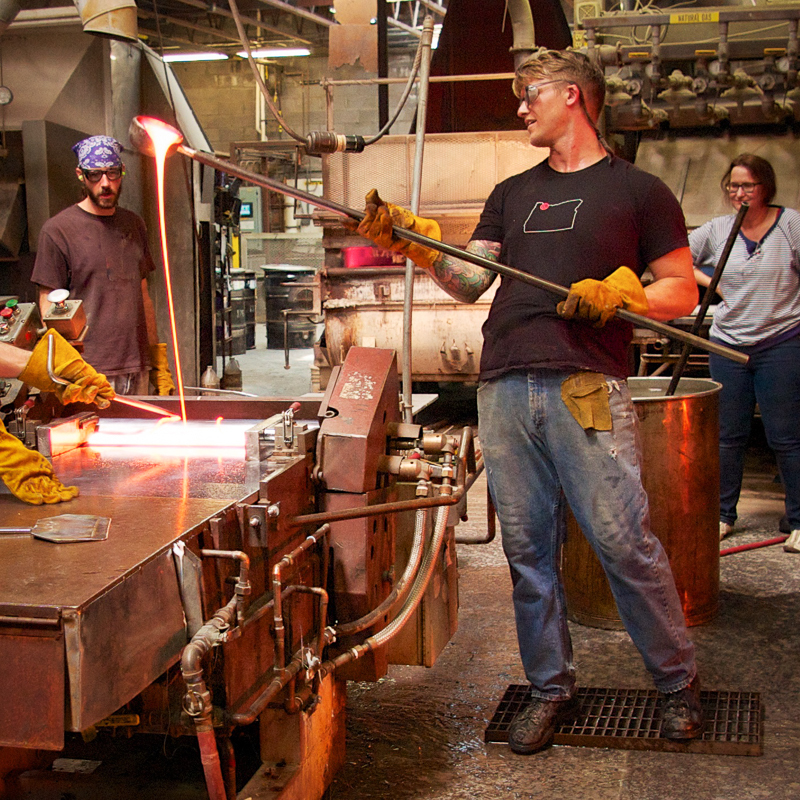 The group will be divided into subgroups, and each participant will have a chance to pour molten glass onto the rollers and help cast the sheets. The groups that are not actively casting the sheets will enjoy refreshments and discuss the experience while waiting their turn. The class will be led by a supervisor from the production team, who will personally coach each person. The Bullseye brand has delved into almost every aspect of the glass art field since making their mark on sheet glass. In addition to manufacturing glass for art and architecture and teaching classes in Portland, New York, Los Angeles, Santa Fe and the Bay Area, they also have a studio in Portland and host exhibitions across the country, all under a branch called Bullseye Projects. They have two galleries: one in New York and one in the Bay Area.